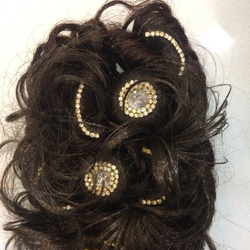 So as to accomplish utmost level of client credibility and trust, we are involved in offering a well-crafted Hair Buns. With an objective to fulfill the ever-evolving demands of our clients, we are engaged in offering a wide assortment of Fancy Hair Juda. - Excellent Quality straight 100% Japanese Kanekalon (high quality one-) made fibre wig with a wig-centring design, It was made of high temperature wire, Therefore, it can be straightened by hair sticks. Being a quality oriented organization, we are engaged in providing a supreme quality range of Decorative Juda. Our firm is one of the renowned companies that offer a wide series of Ladies Hair Juda. These products are available in varied sizes and designs.